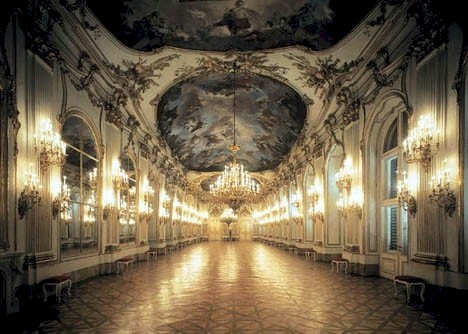 When visiting Castle Amber, one is taken by the enormity and opulence of it. Upon entering the main doors, you would see the main hall. I found a picture that helped visualize what you might see. Keep in mind that Amber is the center of all reality. Castle Amber would be the showplace of wealth, power, beauty, and influence throughout all Shadow. Those of the blood of Amber would be accustomed to the high life; if not in Amber, they could find their heart's desire in Shadow. For some, their heart's desire is to visit and protect chosen Shadows and Shadow dwellers. Gifted with long life spans, Amberites are not immortal. They will risk their lives for such dwellers and the Shadows they inhabit - as fiercely as they would protect Amber itself! These are tales of Amber princes, their companions, and their adventures. Steed's Journals are my main repository of gaming journals. Gérard's ElderMania page by Cal Westray. The current, but not presently active, journal for ElderMania. Run by Jo Ann Spencer. Alexander Burke by Cal Westray. A journal for a character I generated but didn't get a chance to use yet. Dirk Burness by Cal Westray. A journal for a character I generated but didn't get a chance to use yet. This page also contains Journals by other gamers, which prove that there is "always" another side of the story. The counterparts are Steed's Journals: Esprit de Corps and Dressed to Kill. GM-ed by Rain Donaldson. In these journals, Steed is reunited with Mrs. Peel under bizarre circumstances. The Doctor's Journals written by Andy Seiple. This time-lord is 'you know Who' and he goes through some changes that are rather unexpected. It proves the theory that the most 'dangerous' thing you can do in Amber is introduce the 'possibility' of 'actual' time travel. Scout Carter's Journals written by Jack Gulick. An L.A. Police investigator of paranormal activities and the occasional psychopaths. He learns of his Amber heritage while tracking down the most unusual psychopath you have heard of and his companions.